I know, I know, you don’t like your dinner staring back at you. But please heed my one impassioned request: don’t wimp out and get fish fillets. Before you get yourself into a tizzy, hear me out. There are so many reasons to forgo floppy fillets and reach for a whole fish with its head and tail fin intact–the number one reason being flavor. I truly believe that fish tastes so much better cooked on the bone (no bias here). The gelatin-rich backbone is an excellent heat conductor and the fatty skin seals the moisture in, producing sweet-tasting flesh with all the natural flavor of fish and a cushiony texture unsurpassed by any ol’ fillet. Whole fish makes for a beautiful and dramatic presentation the table. If you or your dinner companions are a little queasy, remove the eyes when cooked and stuff the sockets with a few sprigs of parsley. And of course, cooking a whole fish is a breeze (just be sure to ask your fishmonger to scale, gut and clean the fish first!). Simple seasonings–salt, lemon juice, slivers of ginger, or olive oil–are all you need. OK, so we’ve discussed all the wonderful reasons fish should be cooked whole. You must be thinking, what about those darned spindly fish bones? They’re really not that much of a nuisance, honest! All it takes is a short lesson in fish anatomy. Fish have a simple, two-dimensional bone structure and there are fish that lift off the bone more easily than others after cooking: black sea bass, striped bass, flounder, catfish, rockfish, red snapper, trout, etc. just to name a few. When ready to eat, use a knife and fork, or even a spatula, to lift the fillet in sections from the flat bone structure–gently please. After the top side of the fish has been removed, do not flip the fish over! It’s said to be bad luck and if you were a fisherman or a sailor, your boat would capsize. Instead, lift the backbone (I’d leave the head and tail behind to pick at but that’s up to you) to reveal the bottom fillet. What? Now, I have to buy the fish? Now you’re all geared up to cook fish en tout, but ack … cooking a whole fish means buying a whole fish! Never fear, whole fish is brimming with freshness indicators. Fresh fish doesn’t smell fishy. It should smell subtly of the water it came from, whether river or sea. The gills should be shiny, bright red, and odorless. The eyes should be glossy with a clear sheen. After a couple of post-caught days, they cloud over. Fresh fish should be firm, with flesh that springs back when touched. Any mushiness in the body of the fish is usually a sign of age or that it was bruised during netting or transportation. Make sure skin is free of any dark blemishes. The tail should not be dried out, brittle or curled. That’s the end of “Whole Fish 101” and we are now ready for Pranee’s dish. Simple to prepare and oh-so healthy, this dish was a favorite of Pranee’s grandmother, Ama Sua. True to her frugal nature, she would only use the discarded leaf ends of the lemongrass to line the claypot, saving the rest for other dishes. You have to admit it’s a pretty innovative way to steam fish: the lemongrass lattice raises the fish from the bottom of the pot, preventing it from sticking as well as flavoring and scenting it. Pranee didn’t make cuts into the trout because it was pretty slender. But if you’d like to ensure your fish cooks evenly–i.e. that the thinner tail end doesn’t cook before the thicker middle–make two diagonal bone-deep slashes into the broadest part of the fish on each side, about two inches apart. Any white fish with natural fat such as halibut and true cod would work well in this recipe. 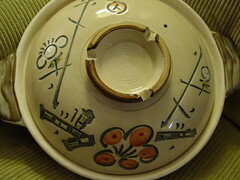 Claypots are relatively inexpensive and are available at most Asian grocery stores. You can also experiment with other steaming methods I’ve outlined here. Tip: Allocate 3/4 to 1 pound of fish per person. If you’d like to steam two fish (I wouldn’t put more than this in the steamer at one time), just use the same amount of lemongrass. Optional: Lay fish flat on a cutting board. At thickest part of the body, make two diagonal bone-deep cuts perpendicular to backbone, about two inches apart. Turn fish over, and repeat. 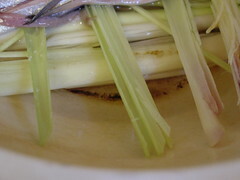 Remove about 1-1/2 inches from the hard root end of the lemongrass and the leaf end leaving about 6 inches of the center. Smash lemongrass with a meat pounder or a large knife to release the essential oils. 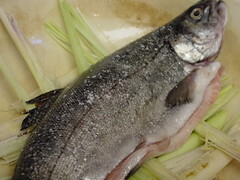 Fold one stalk into half and rub it all over the fish, inside and out. Discard stalk. Sprinkle salt and rub into the fish, inside and out. 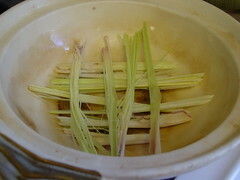 Tear each of the 3 remaining lemongrass stalks into 4 strips. Lay lemongrass in a grid pattern at the bottom of the claypot. Place fish on top. Tuck in the tail if it doesn’t fit. 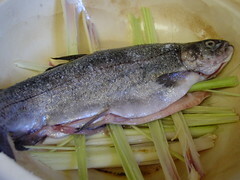 Add enough water to reach bottom layer of lemon grass without touching the fish. Cover with lid and bring water to a boil over medium heat. Once steam appears from the hole in the lid, about 5 minutes, check water level and add more water if necessary. Steam for another 8 to 10 minutes, checking on the water level at least once. At the thickest part of the fish, lift the flesh with a fork and if it separates easily from the bone, it’s done. 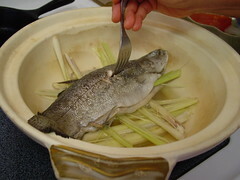 Serve in claypot or carefully remove the fish with two spatulas onto a plate. Spoon liquid from plate over fish before serving. Hi Roland, thanks for your comment. I got the caption from the U.S. Fish and Wildlife Services. The picture you have is of a brown trout, not a brook trout. Hi Diane, my claypot is 12″ across. It’s bigger than most. For your smaller pot, try looking for fish that’s short and squat, perhaps a pomfret? And thanks for being on my side in the whole vs fillet debate! How big is this clay pot? I have one, but it’s only about 8″ wide, so I can’t see it fitting a whole fish. BTW – I totally agree with you about the flavor of whole fish – much better than fillets! I absolutely love whole steamed fish. It’s so easy to make. And with your recipe, I don’t really even need a steamer basket, just the lattice lemon grass. Great idea. Hi Valerie, I know you have to soak a new claypot before using it. I’m not sure if there are any other guidelines. I’m planning to do more research on claypot cooking and I’ll write a post just for you! Hi Kevin, let me know how your fish turns out! Hi! I have a new claypot and I hear there is a certain way to break in a new claypot. Do you know this procedure? Love your site. Brings back many memories of when I was a little girl. Cooooooool idea. I will most certainly give this a shot.